Brief Description: Filling in the Gaps follows on from Peter Keogh’s acclaimed and popular autobiography My Hi-de-Highlife: Before, During and After Su Pollard. This exciting sequel explores aspects of Peter’s life that were left out of his autobiography, including how a gay boy raised on a farm, and in spite of abuse both physical and emotional, was finally able to come out as a homosexual man. This book is at times comical, sexual and heartbreaking and provides further insight into Peter’s relationships with people like Debbie Reynolds, Australian producer John Frost and a distasteful encounter with a famous English MP. The book also reveals more of Peter’s life with the stars, his well-publicised trial in London and his relationship with his partner of 25 years, Sacha. Peter’s life has been a complex mix of highs and lows and his experiences have ranged from hilarious to terrifying. Filling in the Gap details how, against difficult odds, Peter has managed to survive to be the man he is today and will inspire people of all ages, gay or straight, to realise that there is light at the end of every dark tunnel. About the Author: Peter Keogh was born in rural Australia during the 1950s. Growing up in a religious family, where homosexuality was considered anathema, he struggled to come to terms with his true identity. He was also subject to physical and sexual abuse, which was to shape his later life. After a string of jobs, Peter moved to London where he met and worked with some of the biggest names in show business including comedy actress, Su Pollard, whom he married. For several years, Peter enjoyed the celebrity lifestyle, mixing with some of the most famous people of the day, including Princess Diana. After being accused of theft, Peter was also involved in one of the most publicised trials of the time. When his marriage to Su Pollard ended, Peter travelled to the USA, where he went on to work with many iconic stars, including film legend, Debbie Reynolds. Filling in the Gaps follows on from Peter’s first successful autobiography My Hi-De-High Life, and includes more tantalising details of a life well lived. 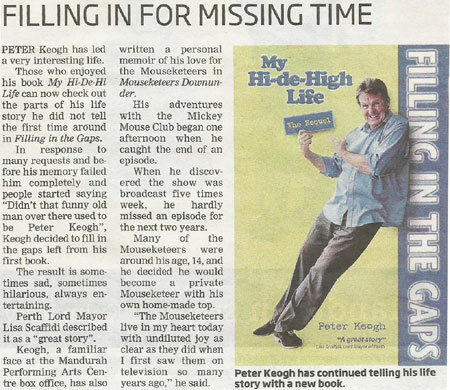 Book publication has also opened up a new career for Peter as an author, with further projects in the pipeline. Finally able to publically acknowledge his homosexuality, Peter lives with his long-term partner, Sacha, in Australia. Filling in the Gaps’ follows on from Peter Keogh’s acclaimed and popular autobiography My Hi-de-Highlife: Before, During and After Su Pollard.This exciting sequel explores aspects of Peter’s life that were left out of his autobiography, including how a gay boy raised on a farm, and in spite of abuse both physical and emotional, was finally able to come out as a homosexual man. 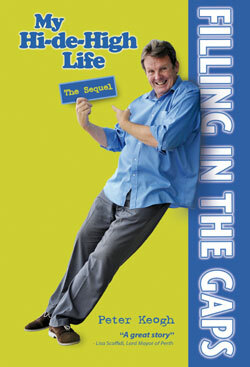 Due to the success of his autobiography this sequel ‘Filling in the Gaps’ illustrates Peter Keogh’s colourful life and is a brilliant read. 30 September 2015 - Peter Keogh was interviewed about his book 'Filling in the Gaps' on Perth 89.7FM. Peter was interviewed on 'The Sue Myc Show'.